Why can't some children learn to read? Katie Johnson's new book explains how vision issues can get in the way for as many as 30% of first graders; others have unfinished developmental patterning which makes reading difficult for them. Reading this small gem of a book is like listening to a teacher down the hall share a great idea. Need a book that will solve many children’s reading problems? 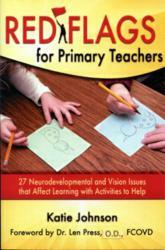 Katie Johnson's new book, Red Flags for Primary Teachers: 27 Neurodevelopmental and Vision Issues that Affect Learning With Activities to Help, just published by Tendril Press, can help teachers of the primary grades with their struggling readers. Chip Wood, well-known advocate for child-centered education and author of the very useful Yardsticks book, wrote that Red Flags " ... is designed to provide dozens of specific activities and strategies from the field of vision and neuro-motor patterning that can make significant differences in the reading and writing careers of elementary school students. Katie does this in a no-frills, straightforward style...."
Katie Johnson, author of Doing Words (originally published by Houghton Mifflin Co. in 1987), has written an easy-to-use handbook for teachers with descriptions of reading problems and suggestions for resolving them. Come into Katie Johnson’s world, the world of six- and seven-year-olds and how they think and move. After forty years of teaching children how to read and write in first grades all over the country, she has seen many puzzles. If you are a teacher of young children, or a parent of a beginning reader, you may have been puzzled by such children too. "Reading this small gem of a book is like listening to a teacher down the hall share a great idea," says John Hickey, special ed teacher in Dedham, Massachusetts. cover one eye when they are reading? write from right to left? move their heads or move the book? skip words? lose their place? give up?! In Red Flags for Primary Teachers, Katie Johnson presents many ordinary children with no labels or initials, with no obvious reason for their lack of success in reading and writing in grades K, 1, and 2. Len Press [Dr. Len Press __title__ ], O.D., FCOVD, calls Red Flags "... a nuts and bolts effort that speaks directly to teachers’ minds and hearts. The result is a book that is a must-read for teachers and its cost is reasonable enough that ODs should consider donating copies to local schools, libraries, and individual teachers." Katie Johnson has taught in public school K and 1 classrooms in Maine and Washington for many years. She has devised, developed, or adapted many exercises and activities from developmental optometrists, neurodevelopmental therapists, and modern dancers to help her students achieve success. On Thursday, May 23, at 7 pm., Katie will be speaking and signing books at Mockingbird Books (7220 Woodlawn Ave NE) in Seattle.